2017 Liquid Force Tao Park Wakeboard. Take a look at the new 2017 Liquid Force Tao Park Wakeboard at S2AS! Daneil Grant (THE best park rider in the world) has stepped up the Tao this year with the addition of the FlexTack System, exclusive to Liquid Force. This brand new technology allows for a flex pattern like no other park board. In addition to that, the uniquely stepped deck profile allows for oyu and your board to merge together, providing a nice lively flex and to be able to sutain your heavy park riding. Established in 2002 S2AS has become known, as the rider owned rider run extreme sports leaders in the UK. S2AS is perfectly located in Poole, Dorset only 20 minutes from the only full Wakeboard cable on the south coast where you can demo all of the Wakeboard equipment we stock in store. In our back yard are some of the most popular kitesurfing destinations in the UK, one being Poole harbour where you will find us teaching Kitesurfing Lessons when the wind is up. We teach in the second largest natural harbour in the world, this provides us with perfect conditions for Kitesurfing lessons right on our doorstep. Poole Harbour is 300 meters of waist deep water so that you can never get out of your depth, offering a solid platform for learning to kitesurf. We pride ourselves on offering the highest quality of Kitesurf lessons available. All of our instructors are British Kite Sports Association (BKSA) trained and highly enthusiastic kitesurfers themselves with years of experience. Here at S2AS were not about just teaching and sending you off in to the world. 90% of our customers keep returning every year to take advantage of the services we provide this allows us to build a relationship and understand exactly what your looking for. This is a not just another watersport this is a lifestyle. S2AS is not just a kitesurf school in Poole, Dorset, Water or snowboard sports shop were a lifestyle brand. Our team lives and loves what we do, If were not teaching kitesurfing or in the shop were at the Wakeboard cable on the beach Kitesurfing or taking trips to the snow. Were putting in the groundwork constantly testing and proving our knowledge so that we can provide the best quality equipment on the market to you. We don't stock anything that we don't believe in, We understand the need you have to find gear that you're going to enjoy and trust riding every time you go out. We spend days testing so you don't have to. Some of the top brands that we stand by are Cabrinha Kites and Slingshot Kites for kitesurfing. They have an amazing build quality for a product that is going to last. For wakeboarding we have Ronix Wakeboards and Liquid Force Wakeboards they are always innovating and pushing the sport to new directions such as the Brain Frame Technology from Ronix. For accessory's we have a huge selection accessories like wetsuits and impact vests from O'neill and Mystic, Sunglasses from Oakley and stand up paddleboards from Jobe and RRD so we have something for everyone. We also arrange Snowboarding, Kitesurfing and Wakeboarding holidays all year round - these are not to be missed! Thats enough about us we want to know about you, Pop into our Shop in Poole, Dorset and say hi If your thinking about leaning to Kitesurf or just want to come and have a look we would love to see you if not in the shop at least on the water. Have fun from all the Team at Surface 2 Air Sports (Rider owned Rider run). Cash on Collection in our store in Poole, Dorset open 7 days a week. If there is going to be a delay for any reason, we'll let you know as soon as we can. If you order after 2pm, we'll still try to despatch that day but, if we can't, we'll despatch the following day. Items ordered after 2pm Friday or over a weekend will be despatched Monday. Our standard couriers are ParcelForce and andCityLink. If you would like your order to be "left safe" on your property should no one be home, please specify details in the comments as you check out. If you cannot thoroughly check the goods please sign for as'unchecked'. It is your duty to inspect and confirm that the goods are in good condition before signing. If the goods are damaged and not singed for as such, Surface 2 Air Sports cannot accept any liability and the item will not be replaced or reimbursed. Please send any item(s) you intend to return in the original packaging. 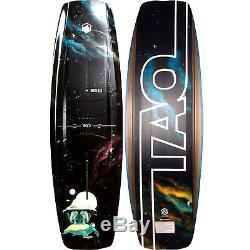 The item "2017 Liquid Force Tao Park Wakeboard" is in sale since Wednesday, May 31, 2017. This item is in the category "Sporting Goods\Waterskiing & Wakeboarding\Wakeboards & Kneeboards". The seller is "s2as" and is located in Dorset. This item can be shipped worldwide.